And with that she lifted her tea cup in toast, and spent the afternoon walking from table to table, chatting about potatoes, stained glass windows, and finally figuring out whether or not a Beekadoodle could carry a coconut. A Outfits Guide for Hissi Day! Hissi Fans from all over Neopia are always excited for every year Hissi Day! Today I bring some cool and different outfits for your precious Hissi(s)! I selected a section full of different types of customizations for your adorable little snakes. Remember, those are only suggestions, you can always add more items and take items from the customs (: Or mix it up with what you already have! Creativity is the limit. Let's go to the customizations: Ballroom LadyItems Used: Decorative Hissi Dress, Radiant Jewel Toned Wings, Dyeworks Blue: Magical Golden Markings, Lighted Globe Garland, Water Faerie Eye Shadow, Musical Jewel Wig, Decorative Hissi Necklace, MME20-S4a: Winter Princess Cape, MME22-S4a: Magnificent Ballroom Background, Dyeworks Silver: Golden Scattered Light Garland, Dyeworks Blue: Rose Gold Vases, Carnival Fan. Do you have an elegant lady? I'm fortunate in many ways. I have Neofriends that help me with various aspects of Neopets. I love to trade NC, battle in the Battledome, collect stamps, play games. I don't excel in any particular area but I don't feel like I fail in any either. It just takes the proper perspective. The other day a Neofriend obtained a lucrative paintbrush from a random event. Was I envious? You bet! Did I wonder why Jacko isn't visiting me? Yep! Did I wish her paintbrush was stolen by the Pant Devil? No, not really. WelI, I would have consoled her if it had happened at least. Another friend was given a nerkmid, another friend given a magical chia pop. I was becoming disgruntled because I wasn't even getting the random codestone or two but I decided maybe it was my negativity. I had gotten into a sarcastic rut that was coloring the way I viewed positive events happening to others. I decided to change my mindset. The citizens of Faerieland are well known for their talents in magic, extending from healing spells to the telling of fortunes. The latter part comes in a number of forms, but perhaps the most popular is Faerieland's zodiac. Divided into six different signs following the alignment of different faeries, it is believed that the zodiac can give insight into the personalities of Neopians depending on what time of year they were born. Far away on a hidden island there exists a rundown laboratory. 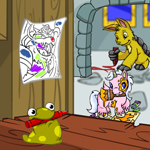 Run by a sketchy looking Scorchio this lab contains marvels of technology that are unseen by both man and Neopet! Or… At least it was supposed to be. Yet… One day one person made a map… And then another… And next thing you know what was hidden away was something that any Joe Schmoe with a handful of Neopoints and a map could find their way too. "Uggggh," Calvin groaned as the boat pulled up to the island's dock. He quickly climbed out of the boat and collapsed onto the dock. "Sea doesn't agree with you huh?" Luke asked as he got off the boat. The second boy was in better condition. He was able to stand on a dock as a red Meerca climbed up onto his shoulders to look around. "That's impossible, Eliss." Eliss and Jris, a candy Aisha and brown Draik, sat in their beach chairs on Mystery Island, fruity drinks in hand. They wore leis around their neck and grass skirts around their waists. The siblings had spent the last two days vacationing on the tropical island. Jris normally wanted nothing to do with his sister's travel plans, and was normally perfectly happy just staying in Tyrannia. But at the encouragement of their owner, Anna, he had reluctantly tagged along. Not that he looked too reluctant right now, lounging in his chair and eating grapes, seemingly without a care in the world. "I'm telling you, Jris," she said beseechingly. "I saw it!" TIP NINE: HATE JERK-FACED JERKS Because of my promise (mostly due to my big mouth, which I seriously need sewn shut) I needed to find a way to help finance my Mom's hospital stay. Sure enough, my Mom was right with her prediction: our savings would only be able to fund three days. So the additional five days needed to be supplied by yours truly. My original plan was to use my own personal Usuki/plushie savings fund and then dive into my other 'in case there's ever a rainy day emergency' fund. And while one fund (the less practical one) only had one hundred Neopoints, my other more useful one had enough Neopoints to help supply two extra days for Mom. 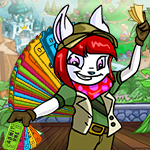 This week's issue is brought to you by: Join Lulu to Explore Roo Island! Stand back, I've got this. My acknowledgement that we're all a work in progress.